Gov’t Mule has a specialty for every season. In spring and summer you’ll find them headlining festivals everywhere—including an annual appearance at the Mountain Jam Festival that frontman Warren Haynes helped found. Come fall and winter, Mule fans clamor for tickets to the band’s musically-costumed Halloween and New Year’s Eve shows. Haynes also organizes the epic “Xmas Jam” with other musicians each December in his hometown of Asheville, North Carolina, to fundraise for Habitat for Humanity. The ambitious singer/guitarist/songwriter has led one of rock’s most dynamic and hardworking live acts for two decades. Though Haynes is exceedingly humble, he has every reason to be proud of Gov’t Mule’s legacy: what started as a side project of the former full-time Allman Brothers guitarist blossomed into a relentless touring force beloved for constant setlist surprises, frequent collaborations, and expert improvisation. 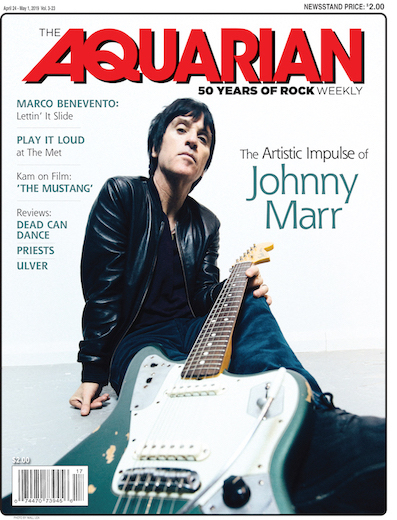 Prior to heading to Madison Square Garden to play the national anthem at that night’s Knicks game—and in the midst of preparations for his huge holiday shows—Haynes graciously found time to chat with The Aquarian. You’re going to do an AC/DC theme at your New Year’s Eve show in New York this year with Myles Kennedy. How’d you decide to cover them? Well, for getting close to a decade now we’ve been doing these thematic shows: one on Halloween, one on New Year’s Eve. Sometimes the theme is covering an artist or a band, and sometimes it’s covering a particular record. Last year we did a Doors set with [Doors guitarist] Robby Krieger. Every year it’s something different—we usually have some sort of special guest and it turns into a big marathon show. [We’ve been] talking about AC/DC for a few years, and we’ve been talking about it with Myles because it’s perfect for him. Vocally it’s a little out of my range, but with Myles being the perfect person for that role I’ll be able to concentrate on playing guitar. It’ll be different and fun for me. We’re picking a nice, long set of fun stuff to do—not just a greatest hits set—but more of the obscure stuff too. AC/DC is party music and New Year’s Eve in New York City is party time, party place. Yeah, I’ve been to a few of your New Year’s Eve shows and I’m always impressed by how you guys really take it to the max every time. Thank you. It’s an undertaking, you know, it’s a challenge. It takes a lot of work and preparation but we love it and I think it makes us better in the long run. Myles was on Mule’s most recent studio album—you guys obviously collaborate well together. What’s it like working with him? He’s such a great guy, for one, and he’s a great singer and guitar player. We’ve known each other about eight years now. When we first met we completely hit it off because he’s such a down-to-earth, fun guy to hang with. We have a lot of music in common. The first time we played together was with Gov’t Mule. He sat in with us a few times, usually in Spokane, where he’s from. And when I was co-producing this Tommy Bolin tribute album, we brought in Myles to sing. I went in the studio with him and worked on his track and he was a total pleasure to work with—he did an amazing job and we just stayed in touch and talked about the fun possibilities. You’re in the process putting out several live archival releases to celebrate Gov’t Mule’s 20th anniversary, including your “Sco-Mule” collaboration with John Scofield and a Pink Floyd-themed Halloween show from 2008. I imagine it might have been difficult to pick the releases, given how large your catalogue is. What stood out to you about those particular shows? Well, we’ll start with the Sco-Mule release, which is a project that has been in the can since 1999. We were intending to release that about a year after it was recorded, but then [Gov’t Mule bassist] Allen Woody passed away and that kind of changed everything. I’ve been wanting to release it—every year we’d talk about, “When are we gonna release Sco-Mule?” and it’s taken until now. I think now is the right time for two reasons: one because it’s our 20th anniversary, and two because we’re able to do a tour next year with John. So there will be a Gov’t Mule featuring John Scofield tour to promote the Sco-Mule record, which I’m very excited about as well. As far as the other stuff, the Halloween and New Year’s Eve shows are the obvious ones to pick from because they’re very unique and special shows. I’m sure there’s more to come, but we felt like those were magical nights and that it would be good to get them out. They were kind of the first choices and then we’ll take it from there. Speaking of magical nights, are there particular shows, tours, or time periods in the past two decades that you consider career highlights or even just favorite memories? Fortunately, too many to mention. Gov’t Mule has been lucky to have shared so many wonderful musical experiences. All the stuff we’re talking about—all the Halloween and New Year’s shows—all the special guests sitting in with us through the years. It’s really just been like a bunch of kids in a candy store getting to do exactly what they want to do and getting away with it. From the very beginning we didn’t start out with the intent of being a band. We were just looking to do a fun side project. Every decision we’ve made since then has been based on what we’ve selfishly wanted to do, and somehow that’s worked out for us. I don’t know that it would work out for everyone. But I think it’s allowed us to take it one step at a time and enjoy every new direction that we embark on. And the fact that we play hundreds and hundreds of songs and have an audience that not only appreciates that but kind of demands it—it’s a pretty unique situation for a rock ‘n’ roll band. So we’re just creating music that we love, utilizing as many different influences as possible, and basing it on the philosophy that if you make yourself happy your audience will kind of follow suit. It’s not a mainstream thing and it’s not for everyone, but the people who dig what we do are extremely tuned into it and we’re lucky to have the audience we have. You’ve been recording with Railroad Earth lately, and you’ve mentioned that this might have something to do with your next solo album. What can you share with us about how that process is going and what we can expect from it? I’ve been a fan of those guys—collectively and individually—for a long time. The first thing we collaborated on was at DelFest a few years ago, where some of the guys joined me onstage for a few songs. It was virtually unrehearsed. We rehearsed for about 15 minutes in the dressing room. And then the next thing we did was at the Capitol Theatre in Port Chester. A little more preparation and rehearsal but not much. It was very loose and organic and we all had a blast. So the seed was planted in my mind to maybe try some stuff with those guys, since I’m supposed to be making a solo record anyway that I’ve been dying to get into the studio and record for so long. Some songs will have just a few of the members, and some will have all of the members. There’s one song that Todd Sheaffer and I wrote together and I’m hoping that we can continue that process and write some more. He’s singing on some of the stuff as well. A lot of it is just Railroad Earth volunteering their musical expertise to help me bring this music to fruition. It falls under the heading of singer-songwriter acoustic-oriented music, but that’s not really a sufficient description because there’s a lot of electric guitar on it as well. There’s a lot of improvising and jamming and there are a lot of songs that are different from each other. It’s very different from my last solo record; it’s very different from Gov’t Mule. It’s really a collection of all these songs that wouldn’t fall into either category, so I’m kind of creating a new category, and everything is falling into that category. It’s been so exciting. We’ve already recorded a ton of stuff and we’re gonna do some more and we’ll see where it all goes. I have a lot of songs that I’m dying to get on tape and then we’ll assess it a little further down the line and see what could come of it. Gov’t Mule will be playing at the Beacon Theatre in New York City on Dec. 30 and 31 and the Tower Theatre in Upper Darby, PA on Jan. 2 and 3. Dark Side Of The Mule is available now. SCO-MULE will be released on Jan. 27. For more information, go to mule.net.